Or am I? There's really not a lot to say about this in terms of plot, because - spoiler alert - it's mostly just the goddamn nativity from the POV of a donkey trying to protect Mary from a ruthless killer she never even realizes is after her. Other than that, there's just not much substance. 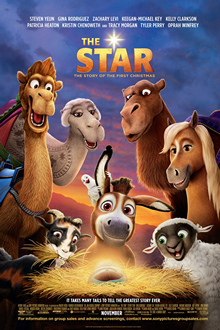 What plot it manages is centered around the donkey's state of mind, as well as a rivalry with Joseph, who isn't remotely as fond of Bo as Mary is. This comes to a head in a generic misunderstanding where Joseph blames Bo for a bunch of collateral damage he doesn't realize was the result of Bo saving them from the bulky assassin. Cue sad trek through the desert followed by obvious realization: this might as well have been scripted by a machine, and they breeze through it pretty fast. Most of the remaining screen time is filled with comic relief and melodramatic musical montages. The contrasting tones make for an odd effect. It doesn't help that the angelic appearances are enhanced with deep blue lights and deeper voices that come off as self-important. A little subtlety would have gone a long way towards selling this material. As it is, the religious aspects feel as childish as the bird's poop jokes. Music plays a big role in this, as well, mostly in the form of pop Christmas tunes. There's an obligatory "Mary, Did You Know" sequence that's particularly cheesy. All that being said, this isn't a horrible animated movie. Based on what I've seen, it falls towards the middle of the pack of low-budget, non-Pixar, CG films. The jokes are generally hit-or-miss, but there are enough that work to forgive the rest. Plus, Dave and Ruth work as characters in this genre. The film also deserves credit for assembling a diverse voice cast and for its depiction of Mary and Joseph, who actually look Middle-Eastern. Though it doesn't fare quite as well in its depiction of the Middle East. There's an extended sequence bearing a striking resemblance to a Chuck Jones cartoon. To be fair, there were some fun moments in that sequence, but it certainly felt off. It gets to the central contradiction of this film: it wants to be a zany, kid-friendly comedy adventure, but also a heartfelt retelling of the nativity. And frankly, it's impossible to be both. You can either parody this or present it sincerely, but oscillating between approaches cancels both effects. Through all of this, the movie makes the mistake of trying to deliver some sort of affirmation of faith, as it pertains to "God's plan." I'm not against stories presenting theological arguments, but doing so in this fashion makes the religion feel, well, comical. Characters speculate again and again that what's happening is part of God's plan, but in this absurd a context, it only begs the question, "Why is God's plan stupid?" The movie winds up highlighting the sillier aspects of the nativity itself, even parts adapted from the Bible and subsequent legends. Personally, I have no problem with that, but it does make me wonder if this is really the best choice for religious parents. And - frankly - who else would care enough to put this on in the first place?